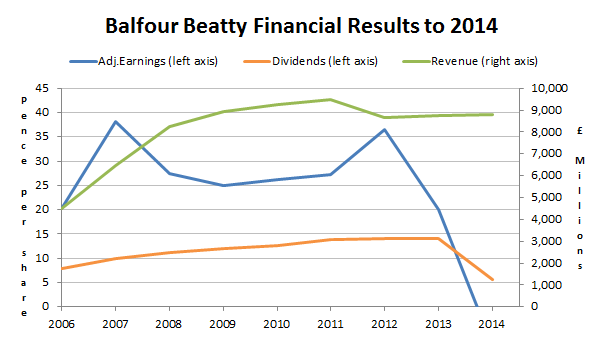 When I bought Balfour Beatty in 2011 the company was still performing well despite some obvious headwinds in the UK and US due to recession-like conditions and government spending cuts in both countries. I thought the company stood a reasonable chance of getting through the slowdown without major problems, and for a couple of years that was true. Eventually though Balfour became more risky and existing risks, which I hadn’t spotted, began to have a serious impact. A few days ago I sold Balfour from both my personal portfolio and the UKVI model portfolio and Balfour has become the first defensive value investment that I’ve sold at a capital loss. After dividends are included it still produced a positive return, but not a particularly good one. Those are the raw numbers, but I think the chart below does a better job of showing how “eventful” this investment has been over the last three years or so. So the investment did not work out well which, in and of itself, isn’t the end of the world. Underperforming investments are a fact of life that active stock pickers must learn to live with. However, it is important to carry out a detailed autopsy into all past investments, especially bad investments. The idea is to extract the right lessons, improve your investment process and avoid making the same mistakes in future. In 2011 Balfour appeared to be having an impressive run of success. It had a long-term Growth Rate of 12.1% (for a definition of Growth Rate and the other ratios I use, see the stock screen page and scroll down) and had increased the dividend in every one of those years. It didn’t have a great deal of debt (just £44m of operational borrowings, which gave it a Debt Ratio of 0.3) and had about half of its business operating on either side of the Atlantic, which seemed to give it some degree of protection from declines in either the US or UK markets. The impact of the financial crisis is clearly visible in the company’s post-2007 earnings. However, the general upward trend was maintained with both revenues and dividends apparently unaffected by the recession. So given that positive picture I added 950 shares to the model portfolio (and a different number to my personal portfolio) on August 9th 2011 at a price of 254p per share. That came to 5.1% of the total portfolio which is a much bigger allocation than I would use today, because in 2011 I was still targeting 20 holdings rather than the 30 I aim for today. For the first year or so Balfour continued to perform well against a difficult economic environment, but by the third quarter of 2012 things began to change. The company announced that profitability would be below previous expectations and that its construction services unit would face a tough 2013. The shares dropped by about 20%, although they soon recovered most of that. 2013 continued that less positive trend. In the 2012 annual results, published in March 2013, the CEO spoke mostly of resilience in tough times and of growth when the recovery came, but revenues and profits declined. The full-year dividend was still increased by 2% despite those declines. In April 2013 the company announced that it was launching an immediate action plan in the face of increasing weakness in UK construction, and further negative announcements were made during the rest of the year. In 2014 things just got worse. The 2013 annual results were very bad, with underlying profits down by around 30%. This time it was a combination of poor results from both the professional services and construction services businesses, with the key problem continuing to be the decline of the UK construction market. As is often the case when companies run into significant problems, Balfour turned primarily to cost cutting, disposal of underperforming and non-core businesses, and internal restructuring and refocusing in order to turn the situation around. In its 2014 Q1 statement the company announced the CEO’s departure. It also announced the possible sale of Parsons Brinkerhoff (a professional services consultancy focused on infrastructure), which had only recently been acquired in 2009 for £382m. Parsons was eventually sold in September 2014 for £812m and up to £200m of that was earmarked for a shareholder return. At the half-year results the story was the same with the dividend held fast and profits down by more than 50%. By this point the construction services business was solidly loss-making, losing almost £70m at the operating level in the first 6 months of the year. In September the dividend was put under “review” and the Chairman stated his intention to leave once a new CEO had been found. All in all 2014 was a very bad year. In 2015 the company found a new CEO (Leo Quinn, previously at QinetiQ) who immediately launched a new transformation program with the goal of reducing costs by £100m and improving cash generation by £200m over 2 years. At that point the dividend was suspended for two payments, with the expectation that it will be reinstated in March 2016. Generally I don’t like to sell when a company is still having problems. I prefer to wait for the turnaround to turn, or at least for it to look like it might turn so that I can sell when investor sentiment, and market valuations, are higher. However, in Balfour’s case the turnaround is expected to take at least a couple of years, and the share price has remained surprisingly resilient in the face of all this bad news. The combination of weakening fundamentals and a steady share price has reduced the company’s rank on my stock screen, down to 132 out of 235, which makes it easily the weakest holding in my portfolio. The weak stock rank and potentially lengthy recovery are the main reasons I’ve decided to sell. The final step in the investment process, after buying, holding and selling a company, is to review what happened. The idea is to uncover any valuable lessons that can then be integrated into your investment strategy and applied to all future investments. This is something I do all the time, and since I invested in Balfour in 2011 I have introduced many improvements to my investment strategy with the twin goals of increasing returns and reducing risk. and what sort of competitive advantages it might have. In relation to Balfour, several of these new checks would have made me more cautious about investing, but one in particular would have ruled it out from the start. This was a lesson I learned a few months ago after Serco (which I also own) ran into serious trouble. Companies that need to repeatedly replace large projects or contracts carry a lot of risk from either not replacing the contract (which of course would reduce revenues and profits, sometimes dramatically) or bidding too low in order to win a new contract. If a contract is won at too low a price it can lock the company into wafer thin profits or even losses over a multi-year period. This has definitely effected Balfour’s UK construction services business. I’m not totally against investing in these sorts of companies but they should have very low levels of debt; perhaps a Debt Ratio (ratio of current borrowings to 5-year average earnings) of just 3 rather than my usual maximum of 4 for cyclical sector companies. While debt wasn’t initially a problem for Balfour, it did increase its operational borrowings every year to a high in 2013 of more than £600m (giving it a Debt Ratio of 3.7), which probably was too high. This is another new check that I added to my company analysis checklist in January 2015 and it would have provided another warning flag against Balfour. My rule of thumb is that if a company spends more on acquisitions in a year than it made in post-tax profits, then that is a “large” acquisition expenditure. The more large acquisitions there are, the more cautious you should be. 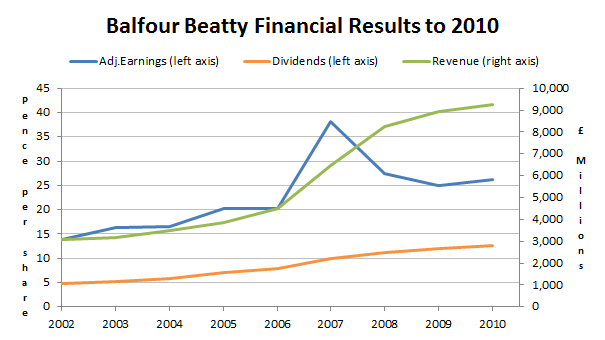 In Balfour’s case it made large acquisitions in the 2007, 2008 and 2009 financial years. In total it spent some £800m on acquisitions in those years while only making adjusted post-tax profits of £430m. The problem with acquisitions is that they usually have to be integrated, and the bigger they are the more disruptive they can be. The new CEO has highlighted these acquisitions as a major cause of the company’s current problems. Although these large acquisitions wouldn’t necessarily have ruled Balfour out as an investment for me, they would have made it more likely. Oddly enough pension obligations aren’t something that gets talked about much, but I think they have been instrumental in exacerbating Balfour’s other problems. The rule of thumb which I brought in a couple of years ago was that a company should have a Pension Ratio of less than 10 (ratio of pension obligations to 5-year average earnings). I focus on pension obligations rather than whether or not the pension fund is in surplus or deficit because a surplus today can quickly become a deficit tomorrow, so a pension surplus is not a guarantee of safety. Limiting the size of the overall obligations is a better way of limiting any potential deficit funding requirements. In Balfour’s case it had pension obligations of £2,795m as at the 2010 annual results compared to 5-year average earnings of £139m. That gave the company a Pension Ratio of 20 which is, quite frankly, massive. How does that impact the company? It means Balfour is at risk of running a huge pension deficit which it would have a legal obligation to reduce, by any means necessary. In fact in 2010 Balfour’s pension plans did have a deficit of £440m, more than three times its average earnings. That year it had to pay £81m into the pension fund to close the gap, only slightly less than the £84 million paid out to shareholders as a dividend. Over the last 10 years Balfour has paid more than £500m into the pension fund and yet it still runs a deficit and the obligations just keep growing (they currently stand at £3,518m). With the dividend now suspended and £85m of the £200m windfall from Parsons Brinkerhoff going into the pension fund, it seems to me that Balfour is likely to be run primarily in the interests of its enormous pension scheme rather than its shareholders. That is entirely as it should be, given the company’s legal obligations to the fund’s beneficiaries, but it does illustrate the importance of looking at pension obligations before investing. And so my investment in Balfour Beatty is over. It doesn’t join the illustrious ranks of N Brown (50% return in 8 months) or Interserve (117% return in 28 months), but it wasn’t a complete disaster and I did learn some very valuable lessons. And anyway, it is the long-term performance of the portfolio which really matters, not the results from any one investment. So now that I’ve sold Balfour I’ll be looking to reinvest the proceeds next month into a better company at a better price, all in pursuit of my long-term investment goals. Note: You can read the full pre-purchase review of Balfour Beatty in this 2011 blog post (the review was in a blog post rather than the UK Value Investor newsletter because the newsletter didn’t exist in August 2011). 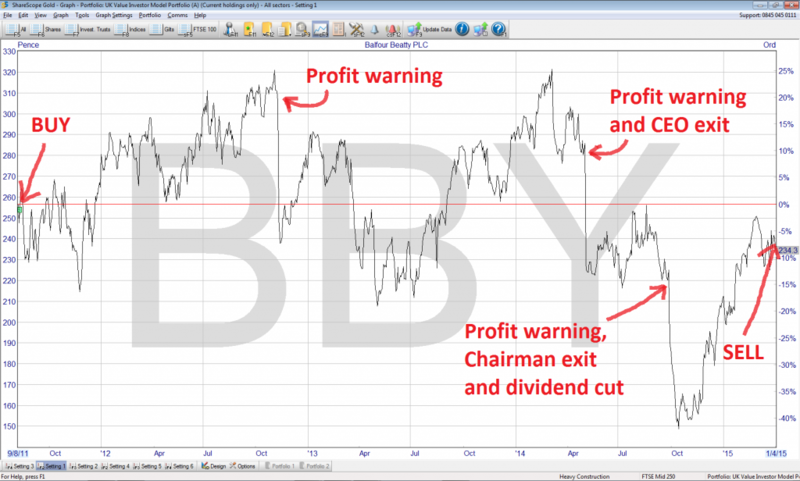 Is this a reasonable example of profit warnings coming in threes (like London buses…)? It certainly looks like it! Unfortunately when things go wrong they tend to go wrong for a while. I am coming to the view to always sell on a profit warning. As a small scale private investor it is would be an advantage I have. Here’s another review of Balfour Beatty and the (in some ways) very similar Serco on the Unconstrained Thinking blog, written by Matthew Tillett for Allianz Global Investors. Another very informative article John! Must say I was looking at a construction company as my first solo investment, and although it is dirt cheap, pays big dividends and in a cyclical industry, they too suffer from lesson 1 (being offshore oil rig contracts). Anyway, thanks for posting such helpful articles, I always look forward to them immensely! Hi Will, thanks. These contract business should definitely be treated with an extra dose of caution. I would still invest in one, but only if it had very few fixed financial obligations. Great post. I think all to often private investors give in to the natural urge to flea from a bad investment and ignore it as a sunk cost, emotionally as well as financially. Hey no problem, I write about losers and winners alike, and as you say the losing investments can more than offset their realised losses by teaching us what to look out for in future investments. In my opinion if you just turn and run at the first sign of trouble you’ll never learn anything. Thanks for this article John. I too sold Balfour about a month ago. We all learn best from mistakes, and we all make them! It is easy to rationalise things with hindsight but, even with the best tools, part of the investing decision is instinct and gut feel about a brand…we’re all human. It is quite possible that Balfour will turn things around but as you say it could be a while. It is interesting that you took a slightly different view with Tesco. Hi Andrew, Tesco is sort of on “death row” and whether I keep holding will depend on its upcoming annual results. But at least by holding on this far I’m up by more than 30% from where Buffett sold! I was wondering whether you ever buy or sell based at least in part on chart patterns? Because that second profit warning combined with the CEO’s announcement to leave produced a classic head and shoulders pattern – an impending sign of doom in my book. Hi M, no I don’t use any technical signals at all. I don’t even look at price momentum, which I know is always popular. I just stick to looking at company fundamentals and the current share price. I sold mine a few weeks ago , all in all with dividends I doubt that I made nor lost anything so an inexpensive lesson I feel. BBY is a different game now and it may go either way. I too watched the chart and thought its long term drift down was not encouraging as was the thin margins that the industry ‘enjoys’. Hi Ken, yes margins and ROCE are woefully thin. A good sign of a company with little or no competitive advantage and/or an industry in which it’s hard to earn good returns. Will be interesting to see how they deal with that pension. They might end up doing a “longevity swap” and effectively insure themselves against the ever-lengthening lifespans of pensioners. Its good to see an investor owning up to their mistakes rather than keeping quiet and only talking about their successes. Nothwithstanding the fixes you suggest its hard to protect against every eventuality, such as random events or mistakes by a management team. How I have dealt with this is simply owning more good companies by widening my portfolio to include US Canadian and European holdings. Some people say this is over diversification, and indeed it would be if the companies were chosen randomly. However if the stock selection process is consistent then this kind of diversification can only decreases the risk without impacting the gain. Hi Andrew, I totally agree; some things we just cannot control (in fact most things in investing) and diversification is the best defence. Although I don’t invest internationally at the moment (at least not outside the FTSE All-Share) I do hold 30 stocks, which is quite a lot relative to most private investors. It certainly helps when one of them misbehaves because each position is typically about 3%, so even a 50% loss on a 3% position is a relatively tiny 1.5%, which isn’t enough to make me lose any sleep. Interesting article John. I find myself thinking about our last e-mail / comment which I don’t think I heard back from you about the issue of “intangibles.” I don’t have figures in front of me but it sound like Balfour Beatty is an organization with a significant goodwill / intangible gap between its book value and market price? Given that, an organization that is “knowledge based” such as this one depends heavily on the motivation of its people – and actions that just focus on cost cutting can often only bring short term relief when introduced by “turn around” CEO’s (artists). In addition the absorption of acquisitions of this type of business, where sustaining the culture that bought success is so important efforts is often problematic. Working towards integration often destroys the culture resulting in loss of key staff, contracts and customers (specially true when being pushed through in the name of cost reductions). This would make a great case study and I think the decision to sell – unless the new CEO comes from a proven background of this type of situation, was probably a good one. Balfour is definitely a people business. It doesn’t have any special brand or technology to differentiate them. It’s just the collective knowledge and skill within the business, and as you say its culture as well. However, that doesn’t translate into particularly good profitability as it’s in a highly competitive industry where each company is as good as the other (at least it looks that way to me as a layman/outsider). And you’re right I think about the acquisitions. They probably made the company too complex, diluting culture and focus, and were a distraction from the real job which must always be to operate a high performance core business. As for cost cutting, in my experience in industry it’s always short-term gain for long-term pain. The CEO/consultants get their bonuses as profits soar, then they leave and it all falls apart. I have seen it several times first-hand. However, as a value investor it may still unfortunately do the job, as it can often drive up the share price to a point that makes sense for me to sell. It’s not a good way to run an economy, but it does seem to be the preferred pattern. Construction companies are in effect un-investable because they can not get a positive return on capital over time – ever. 1. Ultra low or negative profit margins (negative for the many jobs they have to take on below cost to keep the workforce moving). 2. The ROCE is pitiful because of 1, and they are always poised to get screwed when liquidity dries up and a downturn hits. 3. It’s ridiculously competitive – hence 1 & 2. 4. They have huge safety issues and contract clauses that can penalise them under many different circumstances that are always in the clients favour. 5. As you pointed out they get paid to do a job and if they do a good job they may get invited back or they may just be undercut the next time – there is no continuity in the business. Well I would never say never. It would depend on price but I would certainly require a lower price than I paid for Balfour and any construction company I bought would have to have very low levels of debt. Your characterisation of them looks about right though. If I restrict my screen to construction companies it looks like their median ROCE (net of interest payments) is 6%, which is below my minimum requirement of 7%. Their median Debt Ratio (borrowings to 5-year average earnings) is 6.5, which is well above my maximum of 4 for cyclical companies. These are currently no-go companies for me. The only one that has low enough levels of debt is Morgan Sindall and that has negative growth over the last decade, which is another no no for me. Take a look at eBay — will spin off PayPal next quarter – PayPal stand alone is growing at 20+% a year and standalone it’s be worth more than it is today as part of eBay. I’m sure other will appreciate the pointer, but personally I stick to the FTSE All-Share for all my investments, so I’ll have to pass on that one. It is a reminder, as you say to be wary about companies that rely on large contracts. The support services sector is an interesting one. I hold Interserve and Carillion. There is clearly great scope for good profits and comparatively consistent growth in both EPS and dividends. However, things can unravel quickly if your reputation gets hit as you rarely have any tangible moat against competitors. It is a bitter pill to swallow. But you live and learn. At least you didn’t sell at the bottom! It’s really just company specific, as everything is, but as you say it can blow up very quickly and these companies need to keep fixed obligations to a minimum. And I agree, it’s not all bad; I used to own Interserve and did really well out of it; ditto for Go-Ahead. The risks are still there though, especially for something like Go-Ahead which can lose major chunks of revenue when its main train or bus contracts come up for renewal. Yes, I find the likes of Go-Ahead, Stagecoach, FirstGroup all a bit scary as investments. As a regular public transport traveller (esp. trains) I know that some (should that be many?) are very badly run. As a result, they seem likely to lose contracts regularly which does make earnings highly volatile. Also, they often hold huge debt piles which look and feel unsightly as an investor over the long term. Interserve is one of my favourite companies at the moment. I think it is being unfairly punished in the sector. It has a supremely impressive record (although, as we all know, far from guaranteed), a longstanding management team and an excellent dividend yield. We will have to wait and see how the future pans out for it, but it seems good currently! In a few months they will announced the new actuarial estimates, last one was 5 years ago, when interest rates were a little bit higher ..